I have been contemplating writing this post for a few days. I am not sure if this will even go live, so if you’re reading this, I guess it made the cut. So, my last post was about three weeks ago. That was totally not my intent. Life kind of got away from me for a while. It’s not an excuse, but it’s just what happened. As a matter of fact, life has been crazy for the past 2 months and it is my prayer that thing will even out in June and July will be smooth sailing again. I am back in the gym – I signed up with YouFit at the end of April. They were having a promotion where I would get the entire month of May for free, so I signed up. Needless to say, the first day I went was the 25th. So, I wasted 24 free days. My desire is to go to the gym daily. I kept saying to myself that I HAVE to go to the gym, but that makes it sound like a chore. I will have to keep correcting myself, so I would say, I GET TO GO TO THE GYM. It really is a privilege to be able to work out and keep my body in shape. I don’t pray/worship enough – this was a very difficult realization for me. For some reason, I thought I was doing enough. That in and of itself is indicative that there is a problem. My relationship with God shouldn’t be about doing enough. It should be an integral part of my life. The relationship should be stronger and more intimate. I am starting a new job – This has a lot to do with life getting away from me. In April, I was laid off from my job and I have to admit it kind of hurt. I had been there for a few years and starting over wasn’t in my plans. During my time off, I spent lots of time building the systems for my business and social media presence. This past week, I interviewed at an awesome company and they offered me a position. It is in a neighboring city. I will have a longer commute than I did before, but I welcome the change. I am working to be a better wife – My husband and I have been together for what seems like forever, but we have only been married for 6 years; 7 years at the end of July. With all the things we go through on a daily basis, sometimes, our relationship falls by the wayside. Not that it’s right, but it happened. I can admit that I haven’t been as attentive as I should have been. I have to learn to be a mom of young adults – I was a teen mother and my children and I pretty much grew up together. I got a lot of stuff wrong. Like, a lot of stuff. I worked at for much of their childhood and I missed out on may events. I’ve apologized to them many times and I hope they truly forgive me. I did the best I could with what I had. Again, no excuses; just facts. Now, our youngest is 16 and I have come to realize that we have no more babies. I guess I never imagined having an empty nest. 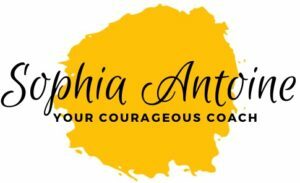 While this blog started out as a way to share information about coaching, it has transformed into something totally different. It’s more about us going on a journey together. I wholeheartedly believe that this is what it’s supposed to be. I know we are all doing life at different speeds and if it isn’t for you, I completely understand. If you are as excited about this adventure as I am, you’re invited to come along. I look forward to sharing the developments with you and I hope you will share yours with me. Now that the awkward stuff is out of the way, what have you been up to? I promise to reply to every comment. P.S. There is still time to sign up for Courageous Camp. Click HERE to learn more. I love sharing your journey with you! We all struggle and we all try our best sometimes to make it through the day, others to improve ourselves and work on our flaws. Keep up the good work, you are doing amazing! United we stand! I have to get back to working out, I’ve been slacking tremendously! Any tips would be appreciated!